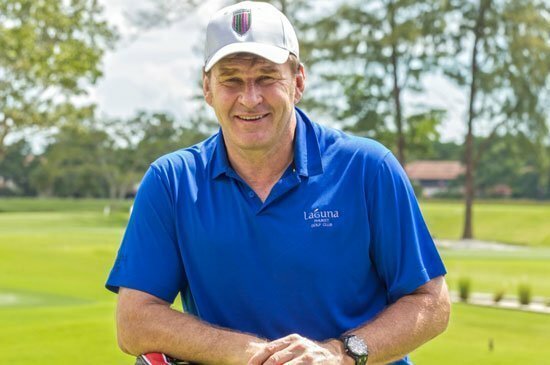 Laguna Phuket, Asia’s first integrated destination resort by the Banyan Tree Group, welcomed Laguna Golf Ambassador – the world-renowned golf legend and six-time Major winner Sir Nick Faldo last weekend, who will be on his way to host the inaugural Laguna Golf Classic at Laguna Lăng Cô Golf Club, Central Vietnam. Staying on vacation at the DoublePool Villas by Banyan Tree, Sir Nick spent time to play and practice at the award-winning Laguna Phuket Golf Club and discover the Group’s newest third brand Cassia – an exciting new contemporary hotel residence concept inspired by a millennial lifestyle. Looking to delight guests to “Live, Laugh and Love their way” Cassia style, a fun “Big Bang – Hit The Green” Poolside Cocktail & Golf Challenge was held at the newly opened Cassia Phuket on Saturday 7 November evening in his honour. Sir Nick graced the occasion where he took centre stage at Cassia poolside and successfully hit over the pool deck’s two swimming pools and onto the floating island green some 100 yards in the lagoon! A huge advocate for junior golf development through his famed Faldo Series tournaments, Sir Nick conducted an exclusive Golf Clinic for around 50 keen golfers, including local juniors and invited club members on Sunday 8 November morning. Set amidst Laguna Phuket Golf Club’s lush setting, the audience were treated to an insightful golf masterclass by one of the game’s greatest ever players. Created in 1996, the Faldo Series gives opportunity to young people through golf and to help identify and nurture the next generation of champions. Since the launch of the newly renovated course this year, Laguna Phuket Golf Club has seen traction and played host to a good number of high-profile international players and celebrities who visited Laguna Phuket, including Sir Nick. 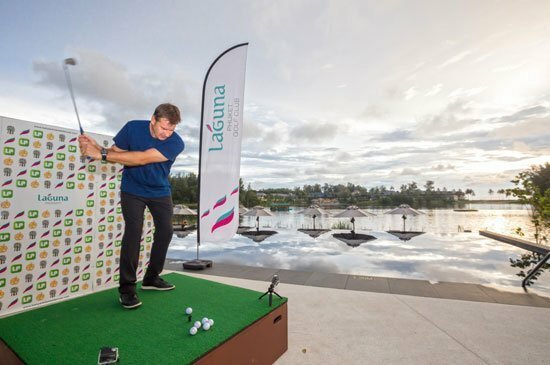 Sir Nick led “Big Bang – Hit The Green” competition with a perfectly pitched shot over the pook deck onto the floating island green in the lagoon in front of the newly opened Cassia Phuket.